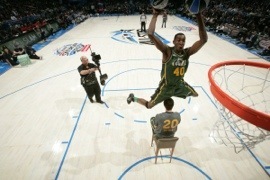 Jeremy Evans pleaded with America to allow him to compete this weekend and he didn’t let them down. Evans won the event with a couple of creative dunks including jumping over Gordon Heyward in a chair and lobbing two balls and dunked them both. He later dunked in Karl Malones jersey over comedian Kevin Hart but I think the vote was in by then. Derrick Williams used Ricky Rubio for a couple dunks and even used a motorcycle as a prop to jump over. Paul George went “Tron” on the arena and shut the lights out and glowed in the dark as he threw a hammer dunk down. His last dunk disappointed as he missed it quite a few times putting a Larry Legend sticker on the glass while dunking. Nothing groundbreaking in this event for sure.